Buildings in Singapore consume about one-third of the nation’s electricity, and chiller plants use up to half of the total building energy consumption. Improvements in chiller plant efficiency therefore have great potential to reduce the impact of buildings on their environment. To that end, Singapore’s Building and Construction Authority (BCA) has recently partnered with Microsoft to implement an integrated IoT solution for chiller plant efficiency, the first government agency to do so. BCA is an agency under the Ministry of National Development, which champions the development of an excellent built environment for Singapore. The new project will complement BCA’s Green Mark rating system, a green building rating tool designed for buildings in the tropics and sub-tropics, originally launched in 2005. Like any good IoT solution, this pilot project combines sensors with data analytics and Microsoft Azure cloud computing to power the Chiller Efficiency Smart Portal. The Portal will cater to 30 commercial and institutional buildings over a two-year period. Clearly I’ve taken a rather short snippet of the entire quote, but this phrasing resonated with me. This is the key to the value of IoT. IoT sensors, cloud servers, and even analytics provide no benefits unless they’re implemented as part of a cohesive solution which drives change. It reminds me of the tree in the forest question. Building managers can be alerted to irregularities via email or SMS, and can view reports of chiller performance to help take corrective and preventative actions. Dashboards of chiller plant performance data are also available, as well as downloadable reports. 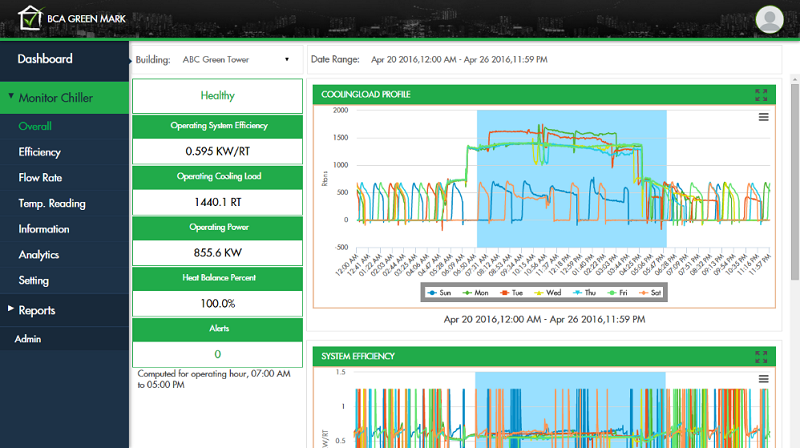 The various analytics enable comparisons of chiller plant performance trends across multiple buildings. The joint press release suggests that this could empower building managers in negotiating performance-based contracts with their chiller service providers. Also announced at this week’s Singapore Green Building Week (SGBW), BCA is rolling out new measures to further drive the greening of the built environment. Initiatives include revamped Green Mark criteria for residential buildings, expanding BCA’s Green Mark’s reach to Africa, and the release of BCA’s third annual building energy benchmarking report.